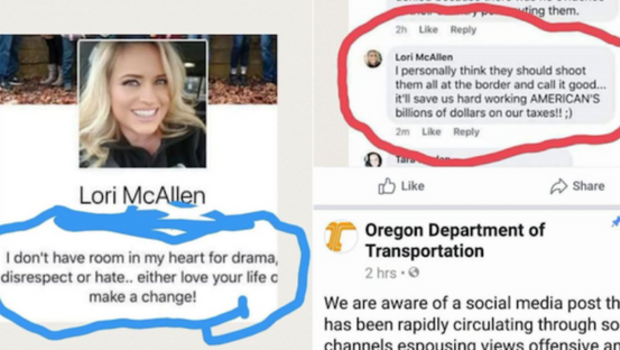 An Oregon DMV employee purportedly made a comment about shooting immigrants on Facebook, leading the Department of Transportation to investigate the situation. In this week’s roundup: Alongside the chaos unfolding at the nation’s borders, hate has continued to flow toward immigrants across the country. This week, we are combining two of our newsletters to track this: The Hate Report and Kids on the Line. With the country’s eyes focused on the crisis unfolding at America’s borders, where immigrant children were being separated from their families and, in some cases in Phoenix, even housed in office buildings, hate has continued to flow toward immigrants in America. In late June, just as the border controversy was heating up, the leader of a fraternity council at Texas Tech University had to step down after it was revealed that he had shared messages in a group chat suggesting that they “hunt” illegal border crossers. Irizarry, who had a permit to be at the park and was trying to celebrate her birthday, posted a video of the attack on Facebook. It quickly went viral. After public outcry, the Cook County state’s attorney’s office filed felony hate crime charges against Trybus. The officer who apparently neglected to help Irizarry also is being investigated and has since resigned. The incident in Chicago is just the latest in a long line of attacks against Latino Americans and immigrants that has coincided with the Trump administration’s increasingly aggressive immigration policies. A report released last week by the California attorney general’s office showed that hate crimes – particularly against Latinos – have surged in the nation’s most populous state. Overall, hate crimes increased more than 17 percent from 2016 to 2017. Anti-Latino or Hispanic bias events rose nearly 52 percent over the same time period. Also in Oregon, an organization that has been labeled a hate group by the Southern Poverty Law Center is tapping into this misinformed sentiment to try to overturn the state’s 30-year-old sanctuary law. Despite its “Portlandia”-driven reputation as a bastion of lefty liberalism, Oregon has a deeply racist past. Oregon Country (which became Oregon state) officially was designated as “whites only” in an 1844 law that ordered all non-whites to leave or face a severe whipping every six months until they left. By 1987, however, political views in this still predominantly white state had changed enough that the Legislature passed a sanctuary law that cut ties between the federal government and state and local law enforcement agencies. The law pledged that no state or local law enforcement agencies would help search for or apprehend people just because they had violated federal immigration laws. Thirty years later, the political tide may be shifting again. Earlier this month, a group called Oregonians for Immigration Reform submitted more than 100,000 signatures in support of a motion that would repeal the 1987 law. The organization, founded by a white nationalist, is a hate group with a long racist history, according to the Southern Poverty Law Center. The center has found 18 hate groups active in the state. Nancy Haque, executive director of one of the organizations that form the immigrant advocacy coalition One Oregon, said the push to overturn the state’s sanctuary law is adding to racial tensions in Oregon. The signatures submitted last week will have to be verified by Oregon’s secretary of state before a repeal measure can be put on the ballot. Another advocacy group, Our Oregon, filed a complaint with the secretary of state accusing signature gatherers of misinforming people to get them to support the measure. The complaint alleges that signature gatherers admitted they were being paid for each signature collected, which is prohibited under state law. In addition, as Haque told Reveal, signature gatherers allegedly informed potential signatories that the measure would let Oregonians vote on a sanctuary law. In reality, the measure would have repealed a law that has been on the books for decades. The image, however, was a hoax. It was a shoddily altered version of a photo taken three years ago by Canadian photojournalist Lasia Kretzel. The sign around the woman’s neck originally read, “My door is open for refugees,” Kretzel wrote in The Guardian this week. But on Sunday, it was different. It was a public figure, a current broadcaster, and a man who still has the ears and eyes of thousands of people daily. And, while you are at it, if you have inside information about what’s going on with detained immigrant kids and families, email us at border@revealnews.org.